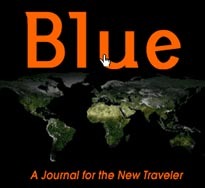 Blue: A Journal for the New Traveler, is a welcome new adventure lifestyle magazine. Witty and savvy, Blue is loaded with adventure-oriented vacations, "extreme" sports, as well as reflections of the global diversity in politics, economics and social concerns. Blue is about travel and adventure as a metaphor for leaving "home" and exploring ourselves. Well-written stories combine with revolutionary art design by the noted David Carson. Cool web by Flat Inc., a New York based culture-design company. Would you even imagine mountain biking from Afghanistan to Israel? skiing the sands of Namibia? snowboarding the Alaskan backcountry? surfing the monster waves in Maui? paragliding through the Himalayas? free climbing the Empire State Building? bungee jumping from the Golden Gate Bridge? Then Blue is for you!